Stanley Wanlass -Professor Emeritus, B.F.A./ M.A./ A.F.A.S., taught at numerous universities in the United States, Canada and abroad including the European Art Academy in Paris and the University of Grenoble, France. He is president of Renaissance International, Inc. a design studio based in Oregon. Wanlass, who resides in Oregon and Utah, is an internationally known automotive sculptor and painter. He also creates heroic bronze historical monuments. His statements are of beauty and the pursuit of excellence. Wanlass creates limited edition automotive bronze sculptures echoing his love for the automobile which he has collected, restored and raced since the mid-fifties. His collection of automobiles varies from early Alfas and Bugattis to Brooklands race cars, Indy cars, Ferraris and '32 Ford roadsters. 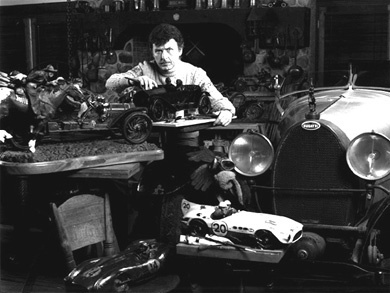 His automotive sculptures and paintings echo his eclectic automobile collection and are represented in the most prestigious museums and private collections world-wide. His historical monuments are located at national memorials, universities and public places nation-wide. Wanlass has always had a passion for cars. As a child he sculpted them out of soap bars. During the 50's as a young hot rod enthusiast, he built two 1932 Fords which he showed and raced. To support his automotive pursuits he striped, flamed and scalloped local hot rods and customs. and "just plain sensuous" by others. The Detroit News says "Wanlass bronzes seem to be moving despite being trapped in bronze." The great Peter Helck calls Wanlass "the finest sculptor of the automobile", while Automobile Quarterly considers Wanlass "the ranking sculptor of the automobile." Wanlass does extensive research on each of his art works. However, he takes license with the facts if it will help his composition. "I change what ever I need to in order to establish a symbol. Facts bore me. I'm more interested in truth." He feels comfortable stretching history and condensing time and space to bring together a dramatic depiction of the spirit of the subject...a symbol, a gestalt, a truth. "Cold exactitude isn't art, spirit and form are more important. Content and meaning are also important, however, form (structure) is the first consideration. Good design is the structure that supports the statement. If the form and statement successfully interact a symbol is born. It becomes more than the sum of its parts." "It is through these symbols, truths of the past that we are better able to understand our time and ourselves. We are comfortable with the known drawing on our knowledge of the past is how we decipher the present. I feel that NOW is a more important statement to make than THEN. I make statements about NOW using THEN." Stanley believes "The automobile is the only really new significant art form of the 20th century. For thousands of years man relied on the horse and wagon for transportation. Then this contraption comes along and revolutionizes the world." Wanlass is a hopeless idealist and romantic. "I believe in the God-given genius of certain individuals, and I value a society that makes their existence possible. I feel a responsibility to history, a great debt to those that came before me who improved the world to a point that I might have the opportunity to create. Jefferson stated that 'he was a warrior so that his son could be a farmer so that his son could be a poet'. Life is short and art is long. I would like to leave something edifying, of significant beauty; a tribute to the spirit, dignity and excellence of man."